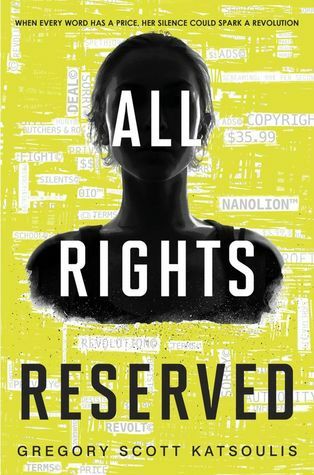 Synopsis: In a world where every word and gesture is copyrighted, patented or trademarked, one girl elects to remain silent rather than pay to speak, and her defiant and unexpected silence threatens to unravel the very fabric of society. But when Speth’s friend Beecher commits suicide rather than work off his family’s crippling debt, she can’t express her shock and dismay without breaking her Last Day contract and sending her family into Collection. Backed into a corner, Speth finds a loophole: rather than read her speech–rather than say anything at all–she closes her mouth and vows never to speak again. Speth’s unexpected defiance of tradition sparks a media frenzy, inspiring others to follow in her footsteps, and threatens to destroy her, her family and the entire city around them. I’ve been excited about this book for ages! I was so pumped when I finally got round to reading it and…well….lets just say I’m a very disappointed book worm.. The concept is so unique, and it has the potential to be absolutely amazing, but it fell so short and I was so close to not finishing it. My first problem was that I didn’t like Speth. She’s an absolute idiot, so it doesn’t help that the story is told from her point of view. Her first decision in the book (to take a vow of silence) is so poorly thought out. I thought that she would grow as a character, but she didn’t. I don’t even understand what her aim was. At first I thought it was to give a big middle finger to the controlled society that she lives in, but there were so many opportunities where she could have said something without being monitored and she chose not to. I know if I was being charged for every work, every gesture, I’d jump at the chance of being able to talk for free! Her inner voice would continuously moan about not being able to communicate but she’d continue to be silent. I grew tired of her fairly quickly. She just made everything so difficult for everyone. And don’t even get me started on how much of a hypocrite she is!! Shanah (The Bionic Bookworm) also picked up on this. Please go check out her review because even typing about Speth is making me slightly angry haha! Secondly, I am a sucker context and this booked lacked in that aspect. Where is the city that they live in? I know it’s in the US… but where? Is the whole world like this? How had this happened? If people could get themselves in loads of debt just from speaking, how could they even afford to live? Are most people living in poverty? Surely if that the case then there would be more Silent people? How much does it cost to copyright a word? Lastly, (and I don’t know if this is just me being picky), but if we were being charged for using our normal language….. surely, we would start to make one up? After all, that is how humans evolved….. but apparently this wasn’t an option in ‘All Rights Reserved’. There are mentions of people mashing words up so they would get charged less but why not create completely mumbo jumbo words and copyright them and start building up a second language? The ending leaves a lot of things unexplained (which isn’t surprisingly seeing as there seemed to be little or no context to start with…) and it felt kind of rushed. I was so pumped to read this, but it’s left me extremely disappointed and I doubt I’ll carry on with the series. Ugh, i felt the same way. Really liked the topic and i thought it will be a great premise. But i couldn’t stand Speth. She was stupid, without any logical explanation. At one point she even said (well, thought) that she has no idea why she’s doing what she’s doing.